Oskaloosa is located in the hub of northeast Kansas. It is located within minutes of Kansas city, Lawrence and Topeka, and is the commercial center of Jefferson County. Established in 1856, Oskaloosa became the county seat in 1858 and was named after Oskaloosa, Iowa, hometown of Jesse Newell, founder of the new Oskaloosa. Oskaloosa is located on two major intersecting highways and is near airports, the State Capitol, Fort Leavenworth, and five colleges and many culture centers. 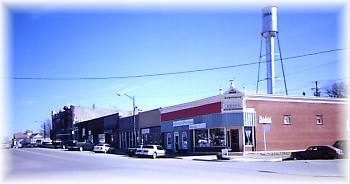 Oskaloosa is home to Old Jefferson Town, a real life display of vintage structures from throughout Jefferson County. The collection includes, a church, school, blacksmith shop, general store, Victorian Home, art gallery, and genealogical center. The city is within minutes from two bed and breakfasts and a golf course. Lake Perry is a great attraction for this area. With its fishing, boating, swimming, and hunting it is a mecca for sporting recreation. Built in Cleveland, Ohio, the bowstring bridge was originally located across Rock Creek, north of Meridan, in 1875. Originally a country schoolhouse located southeast of Oskaloosa, the Tibbot school was moved to Oskaloosa in the 1950's and became part of the grade school, along with the Lone Tree, Kilgour and Plum Grove country schools. The building was moved to Old Jefferson Town in 1975. Old Jefferson Town is a collection of nine restored and furnished vintage buildings from different locations around Jefferson County. They are preserved as a historic town of early day settlements. The town was named because of Jefferson County being referred to as Ol' Jefferson.